Well I must admit that this was not one of our better events. Too many things conspired against us. A beautiful 90 degree day in Minnesota this early in the year and on a Friday killed us. I too wanted to be outside. We will be back but will make adjustments as our open rate on the announcement was an all-time high of 28% whcih tells me they are interested just not with the conditions as they were. Thanks go out to the vendors who understood that we did our part but it just did not work out. Have to be honest. 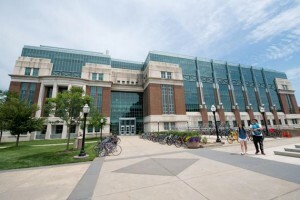 The Microbial and Plant Genomics Institute is housed in the Cargill Building on the University’s Saint Paul campus. Scientists have access to advanced technology and resources in the building and conduct research that could lead to disease-and drought resistant crops, create new ways to treat and prevent human and animal health problems, and develop methods to improve the environment. The facilities at Cargill accommodate research by visiting faculty and researchers to foster national and international collaboration.